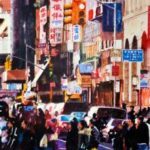 If you have been watching you might have noticed New York City in some of my artwork. That is because there is something about New York City that has taken hold of me. My love of the New York City began more than 30 years ago when I saw the musical “Cats” on Broadway. It became stronger when in 1999 my daughter moved there to work for the Jim Henson Company. 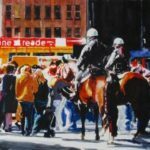 The excitement of NYC coincided with the development of my second career as a watercolor artist. Not sure if this is a “chicken or egg” issue. Which came first? No matter what, I am always ready to collect resource material with my sketchbook and camera to add to my New York City body of work. 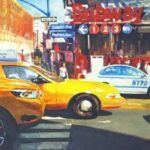 Bette O’Neil-Roderick, a correspondent for the Akron Beacon Journal and a freelance travel writer wrote a feature story about my feelings for New York City in the September 2014 Arts Issue of Akron Live Magazine. 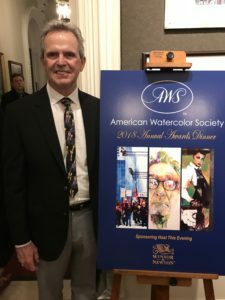 The story entitled Painting the Town, chronicled my attachment to art, my inspiration and influences, my choice of watercolor as my go-to media and my pursuit of every day scenes of New York. 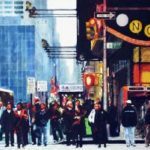 I was invited in 2015 to exhibit in Manhattan’s Chelsea Arts District at the Pleiades Gallery, Friends of Pleiades exhibition. I was invited for a repeat performance in 2016. The exhibits in Chelsea introduced me to a brand-new audience of art lovers. I was eavesdropping during the opening receptions and overheard very complimentary comments about the subject matter. I shamelessly offered, what else but New York City scenes. You be the judge.